Vacuum brazing is the process of joining metal parts by using brazing material without melting them. The filler metal hardens between the flaps to be brazed, thus ensuring the parts are joined together as it happens in a traditional welding process. Thanks to our special brazing technique, at TAG we can create components with specific geometrical properties that are too complex to be achieved using traditional welding processes. Moreover, we can conduct the preparatory stages of the component before performing the brazing process. 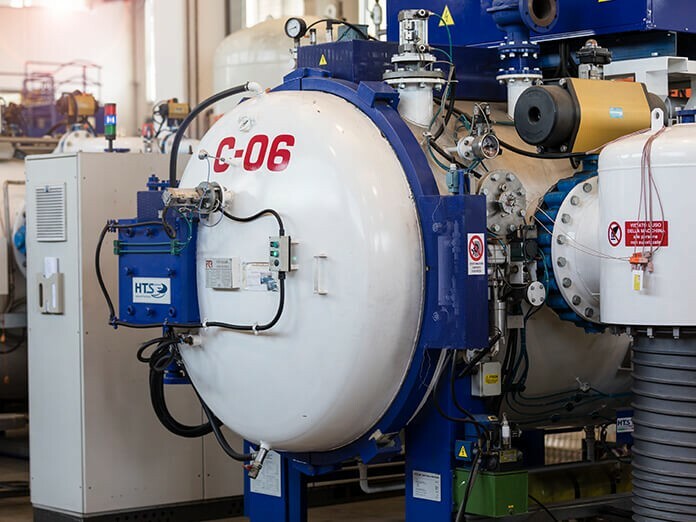 Thanks to our extensive knowledge and cutting-edge facilities, at TAG we perform vacuum brazing processes within a number of application fields, including aircraft, power generation, automotive, food, biomedical and mechanical engineering. At TAG we perform vacuum brazing on steels and superalloys based on nickel or cobalt. The nickel-based filler metal can have a number of chemical and mechanical properties to meet the specific requirements. The Brazing Department also performs preparatory operations on components before processing, such as conditioning, stop-off coating and filler metal preparation and coating. Moreover, it performs tack welding for such component assembly as honeycomb structures. No thermal distortion of the brazed areas. Our facility houses vacuum brazing systems with different dimensions, one of which features a metal chamber. Moreover, the facility is equipped with a FIC (fluoride ion cleaning) system for the prebraze cleaning process performed on the component. The testing of brazed components is performed by our skilled personnel qualified for visual testing at NDT Level II and III. Overall reliability of our products is ensured through Liquid Penetrant, video endoscope and borescope inspection methods.